Every holiday season someone invites you to an ugly sweater party, am I right? Well just because the name of the party is ugly sweater doesn’t mean you have to look drab, in actuality it’s the opposite! It gives you the opportunity to have fun with your outfit, be playful, and not be so serious. I started with this awesome mens holiday sweater from Target. I love the pile of Christmas lights and the saying “light it up” it’s fun, festive and totally not serious! 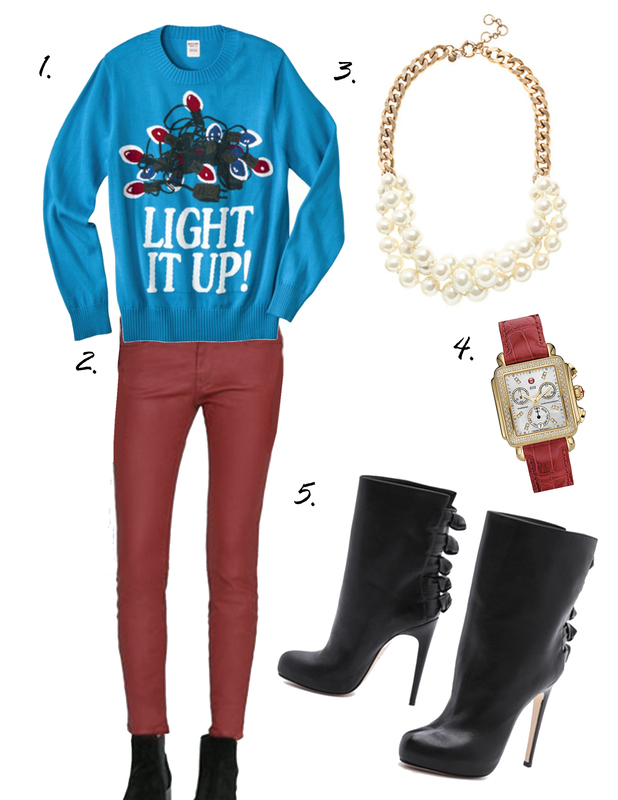 The skinny jeans make up for the oversized sweater you will be wearing and will make the red in the sweater really pop. Oversized pearls are always ok for me and definitely work for the holidays. I love the fact that you can customize the Michele watch. By just switching out the strap, your watch looks like a brand new one. And these boots…I’m in love! Those skinny jeans will have no problem fitting inside and the details on the back make all the difference. 1. Sweater: Mossimo Supply Co. Men’s Pullover Crew Neck Sweater, on sale for $20.98, available at Target. 2. Pants: Skinny Trousers, on sale for $49.99, available at Zara. 3. Necklace: Twisted Pearl Necklace, $125, available at J.Crew. 4. Watch: Michele, $1,945 watch face and $200 leather strap, available at Nordstrom. 5. Shoes: Max Kibardin Armonia Boots, on sale for $597, available at Shopbop.